Just discovered this among Audibles’ new releases and will be listening to it on my way to work today. Can’t wait! Joey Pigza wants to win! In this audio-only adventure, Jack Gantos’s beloved hero races back into kids’ hearts with a tale about running, perseverance, and life’s inevitable crashes. Despite his beat-up old shoes and struggles with ADHD, Joey won’t let anything hold him back – after all, he’s the lightning-fast champion of schoolyard races. But when a high-speed collision leaves him with a dented head and more problems than ever, can our infectiously impulsive hero overcome his hurdles and race to the top? In this zany and surprisingly inspiring listen, perfect for kids ages 8 and up, our chaotic hero realizes he can’t outrun his troubles. Joining him this time around in a series of hyperactive hijinks are his eccentric Granny and his ever-faithful Chihuahua, Pablo. 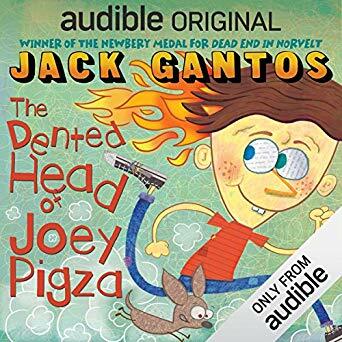 Written and performed by the multi-talented Jack Gantos, and delivered in a wildly energetic voice, this gem is full of the hilarity and heart that made the Joey Pigza creator a Newbery Award-winning children’s book icon.